This entry was posted in annoyances, Birmingham and tagged annoyance, Birmingham Rep, clueless, environment, geotagged, global warming, heatstore, rep. Bookmark the permalink. I couldn’t agree more. These heaters espescially the gas ones are also lethal. Being 6’2″ I always risk singeing myself. Regarding smokers rights, it is part of that mentality that says we infringe human rights when we post up photos of convicted criminals. It’s all bunk. Keep complaining Andy. What is much more sensible is the practice I have seen in many locations of heaters which turn on for 5 minutes when you press a button. That way, if they aren’t being used, they turn off. Best of both worlds, surely? What’s discriminatory about obeying a law against smoking indoors? Put another way, what’s discriminatory about the weather being cold some of the time and warm at others? Like so many unthinking functionaries, your contact at the bar is just fudging a response in terms that sound familiar but which make no sense. the correct person to contact is obviously higher up the corporate ladder. @dp – that’s just what I did, on 2 November, directing them to this post. I’m still waiting for their reply. The REP theatre did bring your comments regarding the patio heaters to my attention and I apologise for the delay in my response to you. This was not in anyway intentional but an oversight on my part. 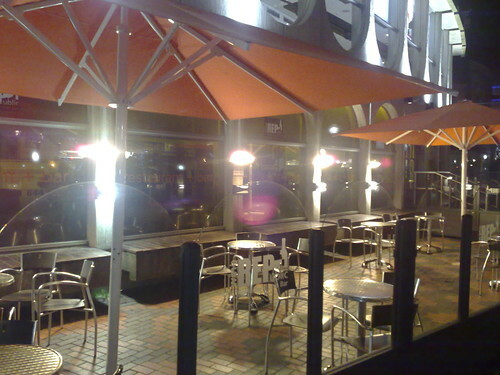 The umbrellas and patio heaters were erected on the terrace in the spring of 2007 so that we could extend the bar/restaurant facilities at the theatre and maximize on the excellent views of Centenary Square. As we often experience inclement weather conditions throughout the year, patio heaters were considered as a sensible option to ensure that patrons were comfortable. Considerable research was undertaken in selecting the most appropriate type of heater. Key considerations were the logistics of the area including health and safety, the environmental impact and the energy efficiency of the heaters. The heaters outside our venue are a very economical and safe way of keeping customers warm. They work in a similar way to microwaves (strange but true) in that they keep the body warm but don’t heat up the surrounding areas. We opted for a solution that didn’t burn off gas, which is a method, favored by other venues on Broad Street and indeed many other pub gardens. Ideally they would be switched on by a push button system similar to lighting buttons installed in public areas in apartment blocks. As part of the risk assessment it was decided that the operating system for the heaters should be automated on a timer system and tamper free. Therefore it is located within the premises in a secure area which prevents the staff turning it on and off at customers requests. The timer is set around our peak times (matinees and evening performances). Mr. Mabbett may I take this opportunity to thank you for the time you have taken to bring your concerns to our attention. Customer feedback is always welcome and helps us to measure our performance as a business. We take our corporate/social responsibility very seriously and manage our business accordingly. For example: We recycle all our paper, our kitchen oil is collected and re-cycled, as are all our used bottles. In the past year we have sourced Fair Trade coffee and tea and our food products are sourced as locally as possible to reduce our carbon footprint. We also only use ethical nominated suppliers. I hope this gives you some insight and reassurance into our business ethic. I’ll leave it to you, dear reader, to decide whether or not they’ve understood or addressed my concerns. But if these heaters do “work in a similar way to microwaves”, watch out for your kidneys! I’ve updated this post with a picture of the label on one of the heaters. As you can see, it’s not “low voltage”; nor, at 1500w, is it low wattage. Another update: there are not six heaters, but seven. Post duly edited. The REPupblic wine bar is not owned by the Rep management but by the NEC group. They bought the rights to run the FOH restaurant and bar when the Rep was struggling financially several years back. Thank you, Graeme, but the structure is surely still owned by the Rep, even if the franchise to run the service has been sold on? The Rep must have agreed to the installation of these devices; and it’s the Rep’s reputation which is being harmed by them.